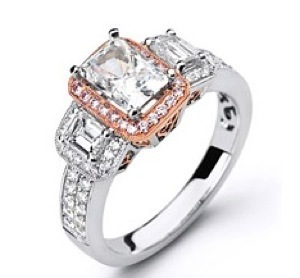 This stunning Simon G engagement ring features a 18kt rose gold split shank with natural pink pave set diamonds. It also features two kite shaped bezel set diamonds as well as round brilliant cut pave set diamonds down the band. This setting is available in platinum, 18kt white gold, 18kt yellow gold, and 18kt rose gold and can accommodate a round brilliant cut or fancy shape center stone from .70ct t0 4.20ct. This beautiful Simon G engagement ring features a half moon shaped diamond on either side of your choice of a center stone and round brilliant cut pave-set diamonds on the band. Available in platinum, 18kt white gold or 18kt yellow gold and can accommodate a round brilliant or fancy shaped center stone from .70ct to 4.20ct. This classic Simon G engagement ring features two oval shaped side diamonds and small round brilliant cut pave-set diamonds going 1/2 way around the band. Matching wedding band is sold separately. This setting is available in platinum, 18kt white gold and 18kt yellow gold and can accommodate a round brilliant or fancy shaped center stone from .40ct to 3.20ct. Melissa Rycroft famous for appearing on the Bachelor and Dancing with the Stars wed her long time boyfriend in Mexico trading his and hers wedding rings designed by Simon G. Melissa received two bands from her new husband Tye. Both wedding rings are 18kt white gold with round brilliant cut diamonds. The first was designed to fit perfectly around her engagement ring while the other is a three dimensional band to wear on her right hand. Tye’s ring is a brushed 18kt white gold traditional and classic band. This stylish Simon G engagement ring features round brilliant cut pave-set diamonds on the split shank and unique twist basket. Available in Platinum, 18kt White Gold or 18kt Yellow Gold and can accommodate a round brilliant center stone from .70ct to 4.20ct. This dazzling Simon G engagement ring # SG MR1494 features sparkling micropavé-set round brilliant diamonds that beautifully accent your choice of a center diamond. Available in Platinum, 18kt White Gold, Yellow Gold or Rose Gold and can accommodate a round brilliant or fancy shape center stone from .50ct to 3.50ct. This stunning Simon G engagement ring features natural pink & white diamonds that are pave set in 18k pink and white gold. The center mosaic diamonds shown total approx .50ct. This stylish three stone engagement ring setting by Simon G features pave-set diamonds surrounding the 3 main diamonds as well as on the band. 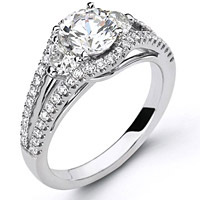 Available in Platinum, 18kt White Gold or 18kt Yellow Gold and can accommodate a round brilliant from .50ct to 3.20ct. This Simon G Split Shank Engagement Ring Setting features a round cut center stone set between 2 half moon shape diamonds. 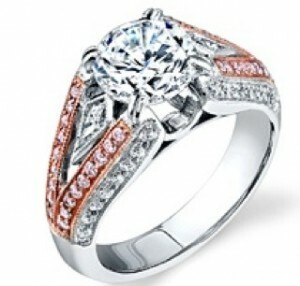 The setting also features round brilliant cut pave-set diamonds on the split shank. Available in Platinum, 18kt White Gold, Yellow Gold or Rose Gold and can accommodate a round brilliant, oval, or cushion from .50ct to 3.50ct. Available in Platinum, 18kt White Gold, Yellow Gold or Rose Gold and can accommodate an Emerald, Radiant, Princess, or Asscher shape center stone from .50ct to 3.50ct.